It was our second day of sailing trip – the best day out of the 7-day Flores trip, I might add. We began our day by waking up on the shore of the magnificent Padar Island at 4 o’clock in the morning and seeing sunrise from the island’s peak, then we continued our journey to Pink Beach where we snorkeled in the clear water, swam around in an even clearer water at Gusung Island, before the boat finally took us to a place called Manta Point – which became the highlight of my trip. All I knew before that was there would be manta rays, endangered marine creatures that look like stingrays but harmless. When the boat was slowing down in the middle of nowhere, far from any island, I heard a few friends screamed quite hysterically when they saw some huge, dark diamond-shaped animals swimming majestically deep in the water near our boat. 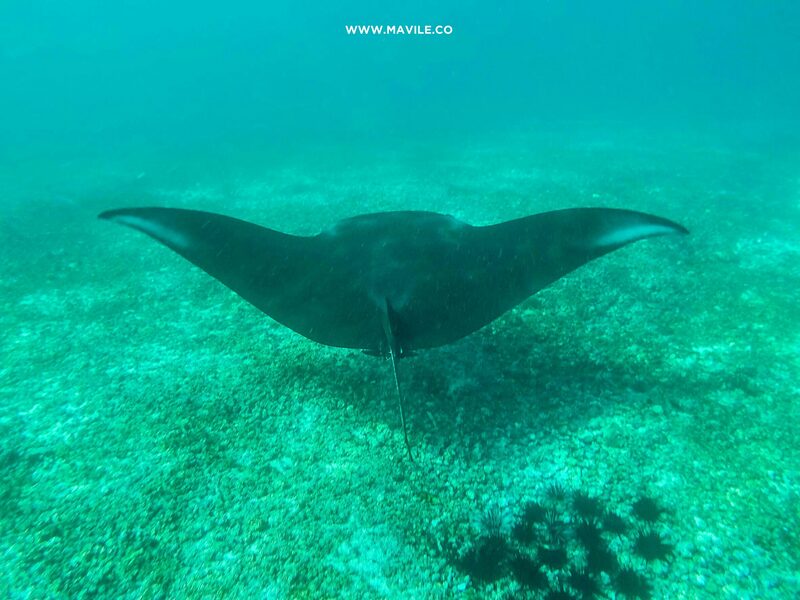 Manta ray is a huge sea animal, up to about 4 meters wide, so seeing them from the boat was already an amazing experience itself. 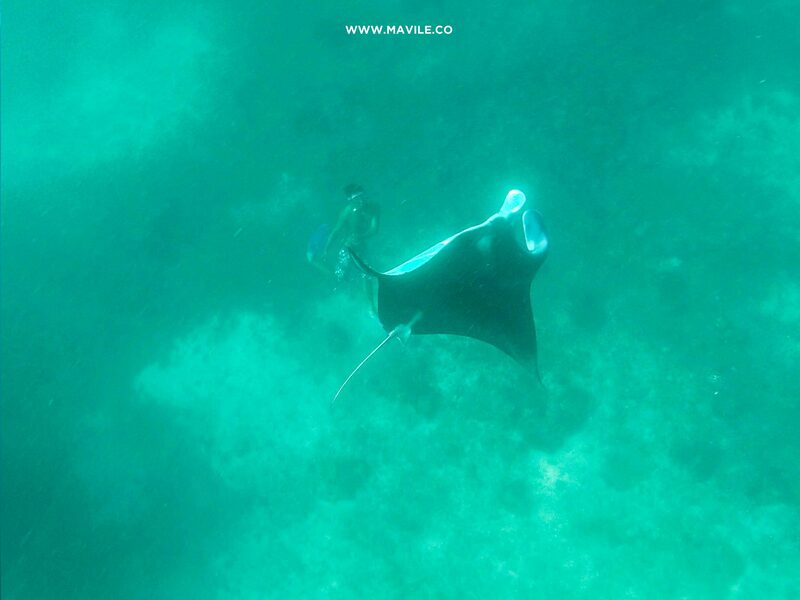 When the boat came to a full stop, one of the crew suddenly asked “Anyone wants to join me and swim with these manta rays?” Well, how could I refuse such an adventurous offer! So from 13 people on my boat, only 4 of us jumped into the ocean and followed the guide as we swam and searched for these amazing manta rays. The water varied from about 7 to 12 meters deep and we’re being told that we might also see turtles, sharks (eek! ), and huge clams around here. When I nervously jumped from the boat (I was the last one to jump and the group was already swimming to further spot), my friend from the boat told me that there’s one right under me. So I quickly looked into the water and saw one, got panicked instead of excited, and swam as fast as I could to my group. 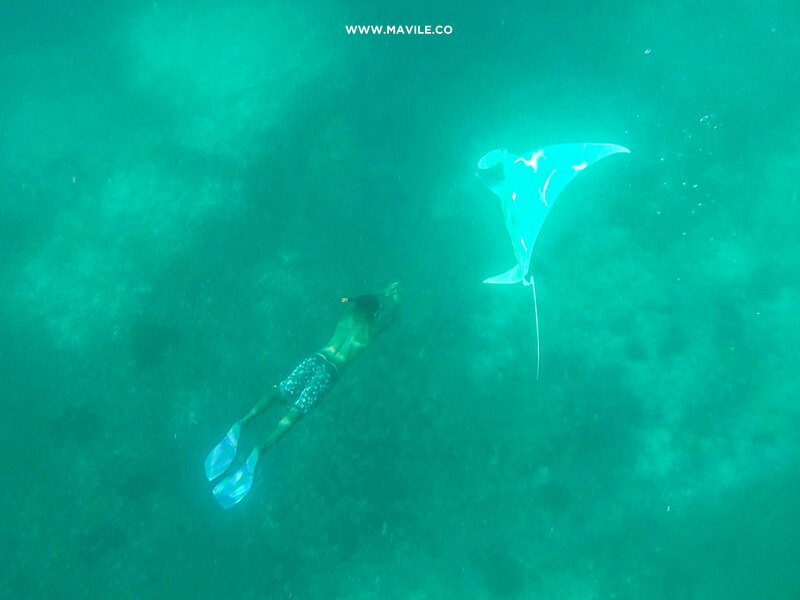 After an exhausting swim and was finally being close to my friends, we followed the guide and saw a group of manta rays swimming around – we had to chase them because they swam quite fast. Once I was calmer, I was able to enjoy it, and I got more and more excited to swim and find these beautiful playful creatures flapping and gliding below me. Few things to note though, don’t forget to use fins to help you swim faster. I was stubborn enough to not wear one and ended up sticking a bunch of pain relief patches (a.k.a. koyo) to my hands and feet on the night after rushingly swam to follow those manta rays. And wear a life vest if you feel like you can’t swim well enough to stay afloat. Eventhough the boat will follow along where you swim, it’s safer to wear it just in case the current becomes too strong. 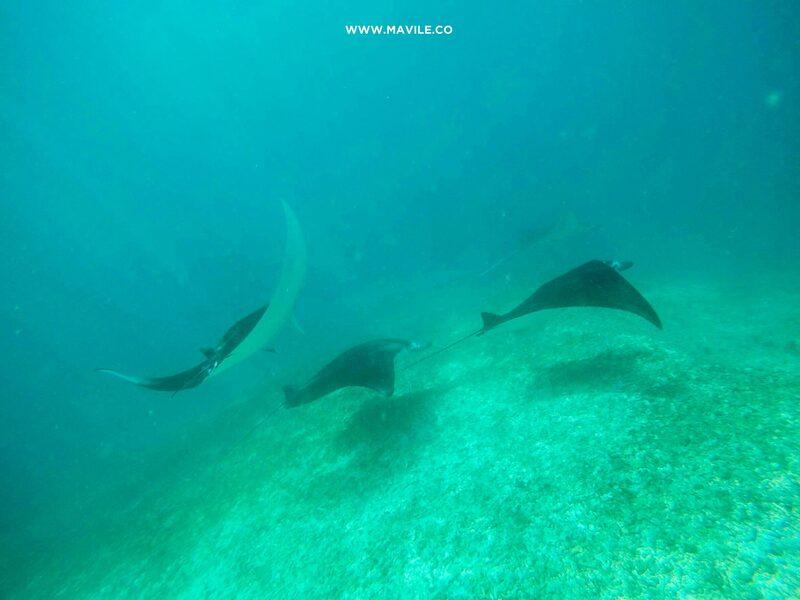 Swimming with manta rays was definitely the highlight of my trip to Flores. With heavenly scenery and experiences like this, Flores is a place that deserves to be on your bucket list.